"The Honorable Ones" will be remembered as one of Star Wars Rebels's greatest achievements of character development. It took an underexplored but fascinating relationship between two mortal enemies and transformed them, both in each other's eyes and in the viewers', by forcing them to work together. Freezing temperatures, a serious injury, and a pair of hungry, sharp-toothed creatures tested their temporary bond, and both emerged with feelings that would have been unimaginable just a day earlier. Most importantly, Agent Kallus came out of the whole ordeal with what appeared to be a fresh perspective on his place in the Empire, which means there's no telling where his character will go next. The moment Zeb saw Kallus aboard the Imperial station orbiting Geonosis, he leapt for the ISB agent without bothering to contain his fury. The two instantly sunk into their familiar close-quarters combat routine. They were playing their comfortable roles. Zeb was so immersed in that fight that he lost the chance to regroup with the Ghost; he couldn't retreat because he had fully committed himself to the duel, which is as good a metaphor as any for the perils of dogma over pragmatism. Kallus, too, couldn't let Zeb go. When the Lasat ran for an escape pod, he followed, and ultimately it was their continued struggle in the pod's close confines—an unwise brawl, but one that neither could resist—that damaged the pod and changed its trajectory, stranding them in the dangerous arctic wasteland of one of Geonosis's moons. The episode took a smart turn early on by having Kallus break his leg in the crash. This both made the normally confident ISB agent unusually vulnerable and forced Zeb to make the honorable choice by letting him live. You could clearly see Zeb's facial expression change, once he saw Kallus's injury, from glee at the chance to avenge his people to resignation at the need to keep Kallus alive. Sure, Zeb tried to pretend that his choice was about personal satisfaction—"I'd rather wait for you to heal..."—but it was obvious that this was just his way of rationalizing his honor, of trying to avoid seeming weak in Kallus's eyes. In reality, he didn't just prefer a fair fight; he needed one. He refused to take advantage of an unfair fight, no matter how much better he might feel after killing the scourge of his people. "The Honorable Ones" suffused tension through the two unlikely allies' struggle for survival on the desolate moon. Moments of humor—Kallus: "How is it that you have bested me even once?" Zeb: "Oh get a sense of humor, agent. "—alternated with moments of foreboding—the "Chekhov's gun" moment when Zeb stuck Kallus's rifle in the snow and walked away, leaving Kallus to eye it cautiously—to produce a fantastic interplay between the two characters' ideological stubbornness and their pragmatic need to cooperate. 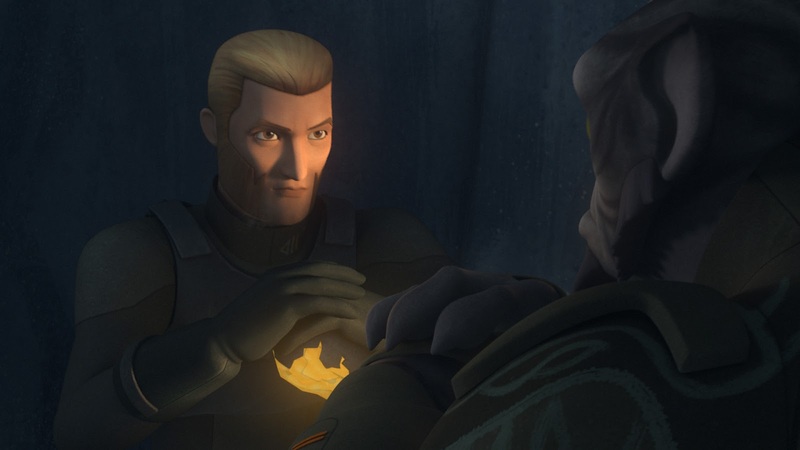 There were also several moments left viewers to dwell on what the characters were really thinking, such as the exchange of glances when Zeb gave Kallus the glowing rock. Kallus regarded Zeb's generosity with suspicion, while Zeb returned the glance with a look that said, "Don't think this means I like you." Kallus's panicky side also emerged in this episode, in one serious moment and one lighter one. In the serious moment, Kallus called out after Zeb as he walked over to the glowing object he spotted and picked it up. That moment—with his broken leg agonizing him and the cold settling in—was, in my opinion, when Kallus truly began to lose his composure. The other moment might have been more of a gag than a sign of Kallus panicking, but I have to mention it anyway, because David Oyelowo's delivery was fantastic in the scene. When Zeb swore as he climbed the stalactite, Kallus responded anxiously, "Karabast! Karabast! What does the even mean?" This was probably just a bit of meta-humor, given that "Karabast!" has become almost a Zeb trope at this point, but I loved it all the same. Importantly, both Zeb and Kallus had a moment in which they saved the other person's life despite it not being necessary for their own survival. Zeb didn't have to keep holding onto Kallus as the two swung from the stalactite with the carnivorous creatures lashing at them below. He could have dropped the Imperial and it wouldn't have been a killing, per se. But Zeb knew he'd never be able to sleep at night if he did that. In that moment, he was responsible for Kallus's life, and he accepted that he had to protect him. Kallus returned the favor soon after, as Zeb scrambled over the edge of the cavern roof with the creatures on his heels. When Zeb saw Kallus pointing his weapon at him, he briefly thought that the agent had reverted to his "normal" self, and he appeared to curse himself for ever trusting Kallus. But then Kallus fired at the creature menacing Zeb; he, too, had forced himself to make the moral choice despite his allegiance. Zeb and Kallus's time together taught both of them important lessons—about themselves, their enemy, and, in Kallus's case, maybe even his faith in the Empire. Let's start with Kallus's view of Imperial rule. Early on in their time together, Kallus remained supremely confident that he was on the right side and that claims to the contrary were based on lies. "You don't know much," he told Zeb when the latter impugned the Empire's respectability. It was a reminder that the ISB agent genuinely didn't see the Empire the way Zeb did—not just that they disagreed about the morality of its actions, but that Kallus thought Zeb was misinformed as to the facts, too. Kallus and Zeb also had the expected propaganda argument, with the Imperial talking about winning informants and double agents based on the supposed futility of the Rebellion and Zeb bragging about the rebels winning converts repulsed by Imperial brutality. Neither side seemed willing to budge. But Zeb seeded some doubts in Kallus's mind as the two discussed Geonosis. Zeb asked Kallus what had wiped out all life there. Instead of refusing to explain or saying he didn't know, Kallus said something different and very important: He didn't ask questions. Zeb, of course, seized on this deeply important admission to urge him to do just that. "Afraid you'll learn the Geonosians were wiped out by your precious Empire?" he taunted. This seemed to embolden Kallus, who replied that he didn't see a point in doing that. As a good Imperial, he operated on the assumption that the Empire didn't engage in casual brutality, although later we would learn that he had already begun to consider otherwise. Zeb again urged Kallus to chase the truth, and it was here that the episode reached its allegorical height. Deliberate ignorance is a common theme among servants of repressive regimes. If you suspected that your superiors were doing terrible things, but you didn't need to know the details to do your job, would you look into it? Many of the people who do so become whistleblowers and converts—the very people Zeb bragged about to Kallus. But many, many others simply don't know what their Empire is up to, primarily because they don't want to know. The obvious question now becomes, will Kallus remain one of them? The first real breakthrough that led to Kallus and Zeb's rapport was their discussion of Kallus's modified Lasat Bo-rifle. Zeb begrudgingly acknowledged Kallus's "impressive" close-quarters combat modifications to the weapon but scolded him for having it at all, saying, "It's not a trophy." I really liked the way this initial discussion of Lasan unfolded. Zeb didn't say, "Ah yes, the rifle that you stole after you helped massacre my people." He simply commented on the weapon, and both characters and viewers understood that he was nodding at the dark past that bonded them—the painful connection that Kallus's weapon created between them. But Kallus surprised Zeb, and viewers, by revealing the weapon's true past. He had received it from a Lasat guardsman he slew, who gave it to him as part of a Lasat tradition. In this way, Kallus had participated in one of the most honorable traditions of Zeb's people—and as the Lasat rebel took this in, he seemed to realize that part of his reason for hating Kallus had just evaporated. He could no longer believe that Kallus had besmirched his people's traditions by stealing a revered weapon. Instead, with his dying breath, one of Zeb's own fellow guardsmen had brought Kallus into a treasured Lasat tradition. And Kallus had another surprise for everyone: A brush with a brutal, dishonorable Lasat mercenary working for the Onderon resistance leader Saw Gerrera. In a nice nod to The Clone Wars, in which we saw Gerrera clash with the Jedi over the nature of honorable combat, Kallus revealed that his first mission had been to Onderon, and that the mercenary had cemented his impression of Lasat by slaying his entire unit—even the injured, defenseless ones. Two things happened in this moment, one within the episode and one on the meta level. Within the episode, Zeb took in Kallus's story with a combination of despair and recognition, and he tried to cling to his people's honorable reputation by saying, "You can't judge all Lasats as the same." Kallus asked if that also applied to Imperials, which was a lopsided analogy, but it did raise a question that neither of them wanted to answer: to what extent did one's membership in a species or government automatically mark them based on one's past experiences. On a meta level, Kallus's story of a dishonorable Lasat informed his previous fear that Zeb was about to kill him as he lay defenseless on the floor of the escape pod. After all, the last time he was in that predicament, he only survived because Saw Gerrera's mercenary sadistically wanted a survivor to retell the story of his ruthlessness; Kallus's similarly injured comrades weren't so lucky. When Zeb let him live, then, Kallus realized a central lesson of this episode, with its contrast between Zeb and the Onderon mercenary: That Zeb was one of "the honorable ones." After the two escaped the cavern, the Imperial officer opened up even further to the rebel fighter. "It wasn't supposed to be a massacre," he revealed, looking shaken as he recounted what happened on Lasan. "But I realized the Empire wanted to make an example." He then offered something like an apology for pretending to be gleeful about the massacre, realizing that in doing so he had only inflicted more unnecessary suffering in a manner that ran contrary to his idea of Imperial honor. Kallus's intent here was unmistakable: by unburdening himself to Zeb, was trying to offer the Lasat some comfort, to the meager degree he could. Even more importantly, he seemed to want to change Zeb's perception of him, which is a startling thought to consider. Zeb returned Kallus's admission by telling him his name, and Kallus revealed that he already knew it, as well as what it was short for, which suggested that he didn't view Zeb as a mindless relict of a supposedly dead race after all. This admission—that he cared enough about Zeb to learn about him—also seems deeply consequential. Kallus is not like any other Imperial we have ever met, especially on Rebels. He genuinely didn't want Zeb, his putative enemy, to think of him as someone who delighted in mass murder. Zeb's opinion of him seemed to matter to him, at least in that moment. In the course of their first conversation about Lasan, Kallus delivered what was perhaps the episode's most consequential line: "I was only doing my duty." One does not have to be a shrewd political observer to recognize the obvious allegory here, but in case your metaphor senses aren't tingling, I'll give you a one-word hint: waterboarding. As someone who loves to see these deeper issues of political and military conduct explored on Rebels—a show set against the backdrop of desperation and insurgency, with both sides facing internal pressures not unlike those facing our own government—I desperately hope that the series follows up on this introspective moment by advancing Kallus's character in a novel way. When the Ghost arrived to rescue Zeb, the Lasat departed with a customary gesture of honor—and Kallus returned it. This deeply significant moment underscored the fact that, despite their status as enemies, Kallus and Zeb shared a lifelong connection to Lasan, albeit for grim reasons, and the Imperial officer didn't try to shy away from that. When Kallus returned to his own ship, he greeted Admiral Konstantine, but his fellow Imperial didn't even seem to notice that Kallus was injured or care that he was safe. The symbolism here was clear: in contrast to the warm reunion that Zeb received—and that Kallus clearly overheard—the Empire didn't care about its ISB agent at all. In that moment, Kallus seemed suddenly forlorn, lost, unsure of himself. He seemed to want the feeling of belonging and importance that Zeb's friends gave him. Back in his stark quarters, Kallus set the glowing rock that bonded him to Zeb—and that he had uncharacteristically held onto—on a shelf. The episode ended with Kallus sitting on his bunk, digesting recent events with what could be despair—or perhaps the faintest glimmering of a fateful decision. "The Honorable Ones" was a phenomenal episode. By forcing two mortal enemies to work together to survive, it changed how these two major characters viewed each other, produced revelations from the less sympathetic one that made him more likable, touched on the biggest issue of the galactic conflict, and opened the door to a dramatic character change. Depending on what happens next, that last accomplishment could become the episode's defining feature. Because in addition to the exciting appearance of Geonosis and the nod to the Death Star's construction, plus the strange and fascinating revelation that there was no longer any life on the planet—that could be an entire episode on its own—"The Honorable Ones" raised what I consider the very real possibility that Agent Kallus will have a change of heart. There are many twists still to come in season 2 of Rebels. But what if one of them isn't in that tantalizing mid-season trailer? What if Kallus, inspired by his conversations with Zeb, takes the Lasat's advice and starts asking questions? What if the answers disturb him and, combined with his reflections on the Lasan massacre, prompt him to defect to the rebels or sacrifice himself to aid them? That would be a fantastic way to send off our heroes' perennial nemesis. It would create a unique opportunity to explore the concept of redemption, giving a run-of-the-mill Imperial officer the same fate that his superior, Darth Vader, would eventually receive. The very fact that this is now possible speaks to how powerful and transformative an episode "The Honorable Ones" was, and I commend the episode's creators for putting together such a compelling story.